The Bentley Supersports fuses elite luxury with the cutting edge of speed. Bentley Continental Supersports. Photo courtesy of Bentley. One doesn’t typically imagine pressing the pedal to the metal, gunning triple digits down the roadway when the car in question is a Bentley. That’s the kind of adventure we typically reserve for sports cars, muscle cars and two-seaters that leave no room for your luxury bag and chauffeur. But such is the case for Bentley’s fastest car, the Bentley Continental Supersports. It cranks through a top speed of 209 mph with a solid 700 horsepower pumping behind it. Sure Bentley has rebranded itself over the years as a different kind of luxury car, now nodding towards its future generation of buyers, wooing even millennials with a cooler iteration of car. Bentley Continental Supersports sports racing stripes to up its style game. Photo courtesy of Bentley. Here it goes from simply elegant to robust and masculine. 60 mph is swallowed up in less than 4 seconds, easily adhering to the curves and nuances of the road without challenging the W12 engine. The Supersports has been in production since 2009. And in that time we’ve seen two iterations of the fastest Bentley in production: a convertible and a hardtop. Don’t get it twisted though. 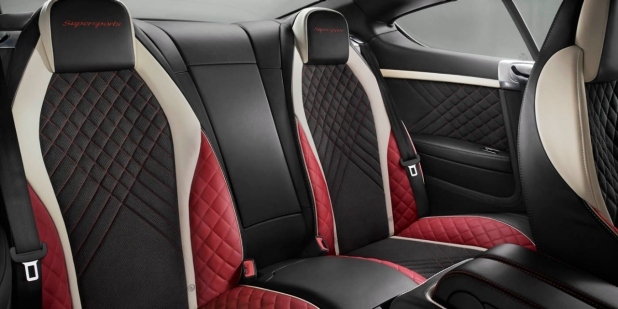 All the elegant nuances are still there: plush interior, seating for four, carbon fibre spoiler and front and rear, three tone split interior and touches of a racing palette to round out the driving experience. Then couple those delicate touches with the heavy lifting that Bentley has done to build its muscular Supersports model and you have something they like to call “extraordinary.” Your torque here maxes out at 700 lb at 2000 rpm. And your engine capacity is nearly 6000 cc. Sure you can keep it classy on the way to the black tie gala. But should you need to outpace the evil spies in a Bond-esque car chase, the Bentley can do that as well. A limited number of the Supersports will be built. Your best bet is to race to your dealer to get yours before they evaporate into a cloud of exhaust. Bentley Continental Supersports interior. Photo courtesy of Bentley.